Any of the board-certified allergists listed here are available to speak to the media for interviews and to answer questions. We have access to thousands of patients who have completed OIT/oral immunotherapy /desensitization treatment, are in treatment, and even some who failed treatment but are grateful they tried. We are families spread all over the country, including Hawaii and Alaska who fly to the mainland for treatment, and many international families who have moved to the U.S. for treatment before returning home. These include Canada, U.K., Australia, and Hong Kong. For so long we lived with NO HOPE of treatment, and were told there was nothing that could be done for us. To “strictly avoid” and always carry EpiPens. That was a lie, and our families are living proof that #OITworks. Specifically, OIT in private practice, with board-certified allergists. We did it without any support from our national organization FARE, our media like Allergic Living Magazine, nor from many allergists, nor from our fellow allergy parents. Rather than being celebrated and seen as inspirational, we have been berated and banned from Facebook support groups for sharing our success with OIT. 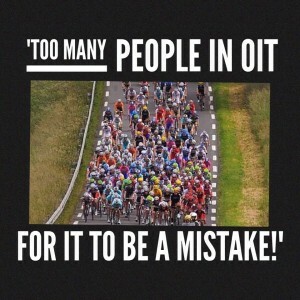 OIT Myths are alive and well among those who are against OIT. 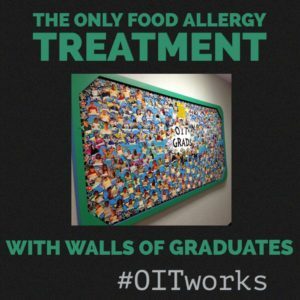 It’s an amazing, soap-opera style story of lives transformed by doctors willing to pioneer therapies to counter the clinically-proven diminished quality of life food allergy families. Contrasted with the attempts of organizations like FARE, publications like Allergic Living, and many Facebook food allergy support group “leaders” who deny it’s success and safety and that it is spreading like wildfire across the country. Families want this treatment NOW. Our 2 Facebook OIT Support groups each have over 7,000 members. It’s our favorite subject to talk about, now that we aren’t reading labels, cooking everything from scratch, and avoiding social events. We have doctors that have successfully treated 1000, 800, 300, 200 patients and more. This isn’t “experimental” anymore with thousands of graduates walking around. However, the focus should be on the REAL heroes: the OIT doctors and the kids. And Liseetsa Mann, who created a tribe of dedicated allergists and families and has saved thousands of kids and returned them to normal lives where food is just, food.